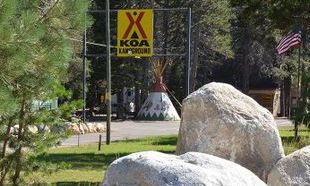 Four miles from the south shore of beautiful Lake Tahoe, surrounded by tall pines with Echo Creek running through, this campground offers a relaxing stay with dozens of activities. Swim, boat or cruise the lake on the M.S. Dixie II paddle wheeler or the Tahoe Queen. Visit the casinos, 9 miles to the Nevada side of the lake. Go hot-air ballooning, horseback riding, hiking, biking and golfing. You also can enjoy kayaking, Jet Skiing or parasailing, and fishing in the Truckee River or other nearby lakes. Our full hookup and tent sites are shaded by tall pine trees, and the DELUXE ACCOMMODATIONS include a Camping Lodge, andKOA Chalet. The Camping Lodge features a full kitchen, private bathroom and shower, the KOA Chalet sleeps up to six comfortably with private master bedroom and upstairs loft! Enjoy the heated swimming pool from mid-May through mid-September. Bring your bicycle and ride on forest trails- or just relax at your beautiful wooded campsite overlooking Echo Creek. Make reservations early as we are a very popular destination!